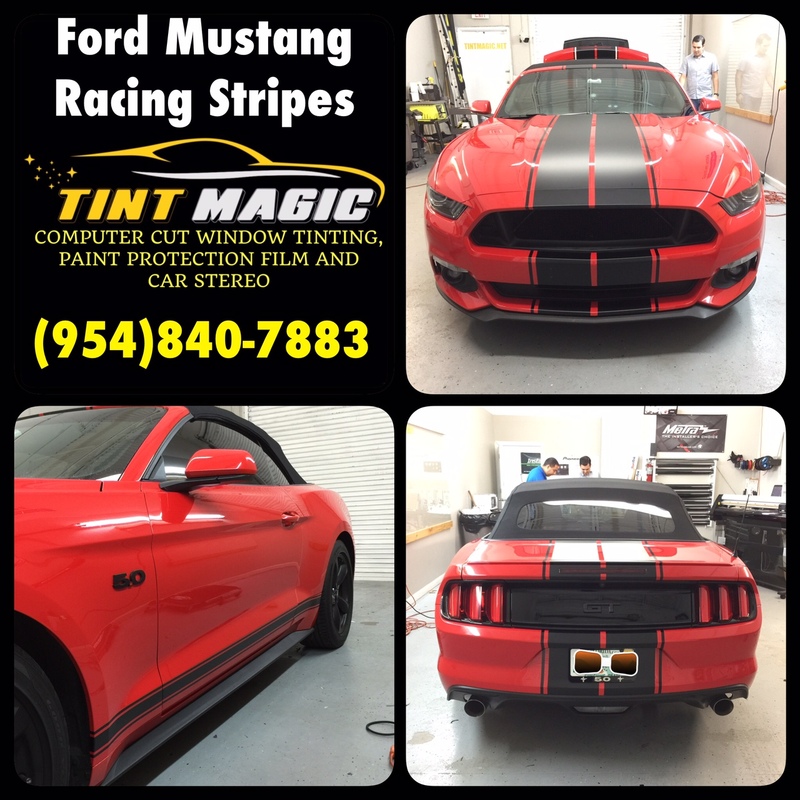 Ford Mustang Racing Stripes at Tint Magic Window Tinting. Call us for a free estimate! (954)840-7883. We are located at 11344 Wiles Road, Coral Springs Fl 33076. The 2016 Ford Mustang is in the second year of its sixth generation. It was a smash re-make for 2015, with a detailed exterior and interior, and excellent technology including leaps in electronic controls for steering, throttle, transmission, and stability. As well as safety, as winning five stars in all tests by the NHTSA, and Good ratings from the IIHS. With all new sheetmetal for 2015, the Mustang endures as unmistakably Mustang, with muscular yet graceful lines on a low and wide stance, and Mustang cues all around. The fastback sweep from the late ’60s Boss 302 is back. The Mustang commands stares with its presence, but if you look too hard or too long you will begin to wonder. Thin pillars will make you think of a Pontiac Grand Prix two-door. The panel around the taillamps channels Mopar. Triple light pipes in the headlamps would be at home in the ’70s. There are two cool appearance packages. Black Accent has 19-inch black alloys, a black spoiler, dark taillamp trim, and pony badging. If you want to go all the pony way, there is the Pony Package, with chrome that tries to turn your Mustang into a time machine that takes you back to the early days. We’ll take black. With titanium paint. Striking. The Convertible is now available with the Performance Package, making a very special car. The multi-layer insulated top is classy and quiet. No desire to go back to the old days of flapping canvas and freezing inside, not to mention manual labor.